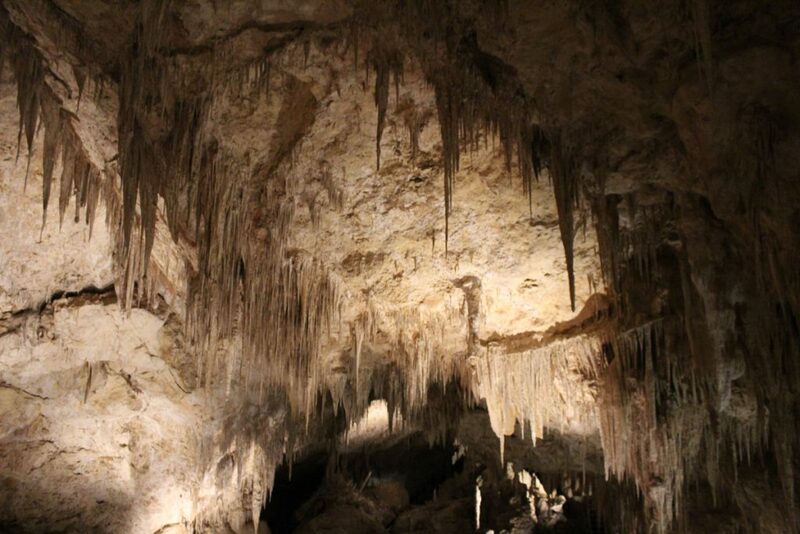 One of the highlights of the Margaret River Region about 300 kilometres south of Perth, Australia is a series of caves stretching from Dunsborough to Augusta. There are over a hundred of them and four have been developed as tourist attractions. 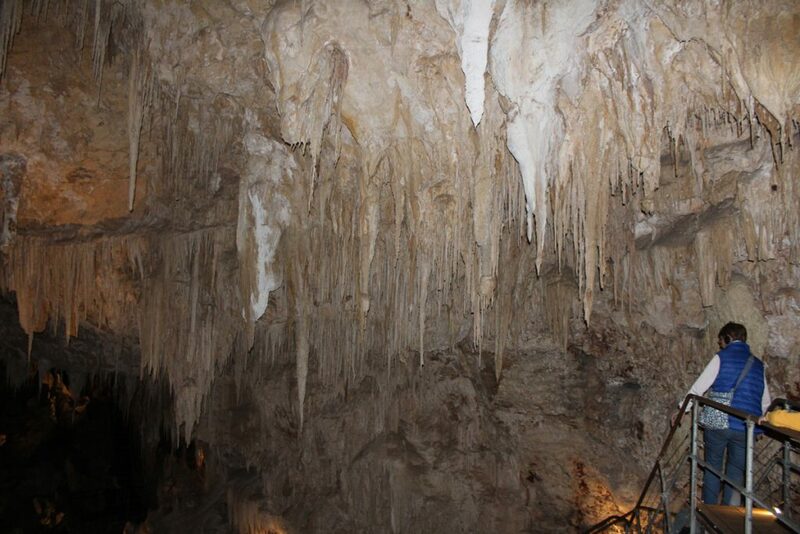 These are the Ngilgi Cave near Yallingup, the Mammoth and Lake Caves not far from the town of Margaret River, and the Jewel Cave down towards Augusta. 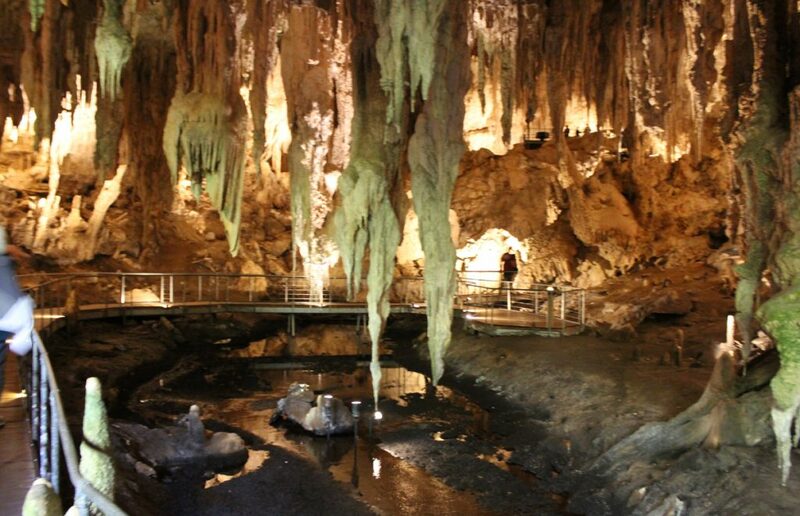 On our recent visit to Margaret River we visited the Mammoth Cave. The name is ironic because, as caves go, it is on the small side. It runs 500 meters with a depth of 30 meters, although there is a side passage to explore as well. The Mammoth Cave in Kentucky, by contrast, has the longest network of surveyed passageways in the world – 640 kilometers of them! The first chamber you see on entering the cave. But despite its compact size, this is an interesting cave to visit. 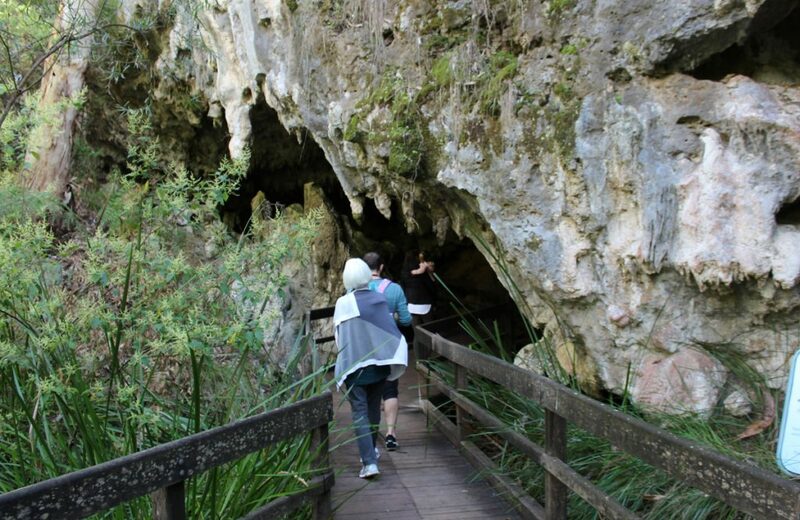 It is the most easily accessible of the four public caves in the Margaret River region and we had no trouble trekking our two year old grand daughter with us. 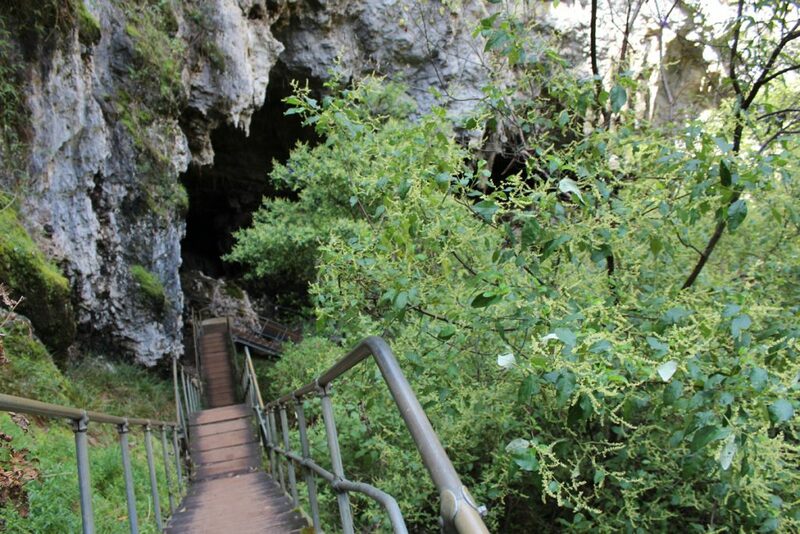 The trail through the cave consists of wooden boardwalks with steel handrails. The first chamber is accessible by wheelchair, though subsequent chambers and passages require the navigation of stairs. The four public caves are all connected by the aptly named Caves Road. You can get tickets for a single cave or for two or more of them. 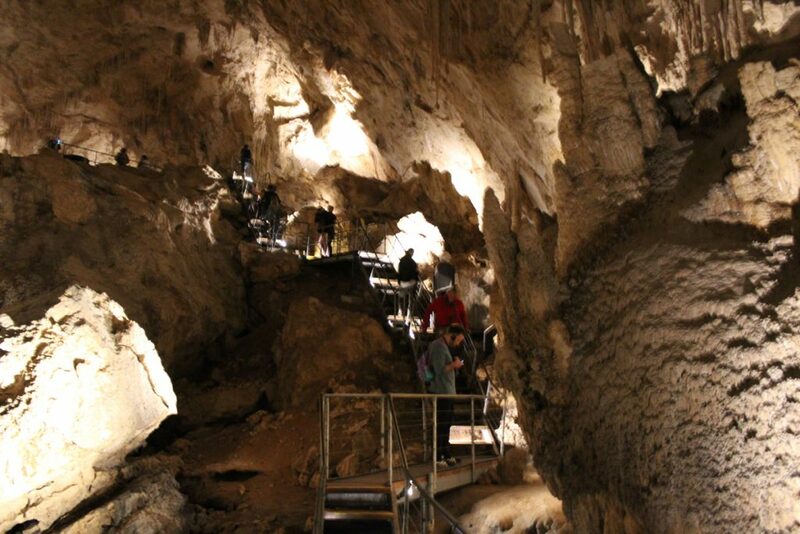 The distance between the two farthest apart, the Ngilgi Cave and the Jewel Cave, is 83.8 kilometers so all are easily accessible in one day. 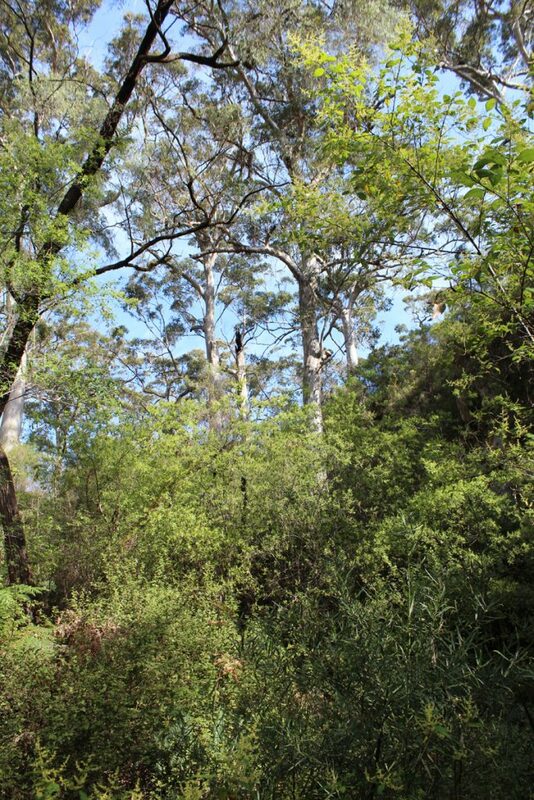 And Caves Road is one of the nicest drives in the region passing by rolling meadows and sheep and cattle farms in the North to magnificent marri and karri forests in the south. A marri forest surrounds the Mammoth Cave. 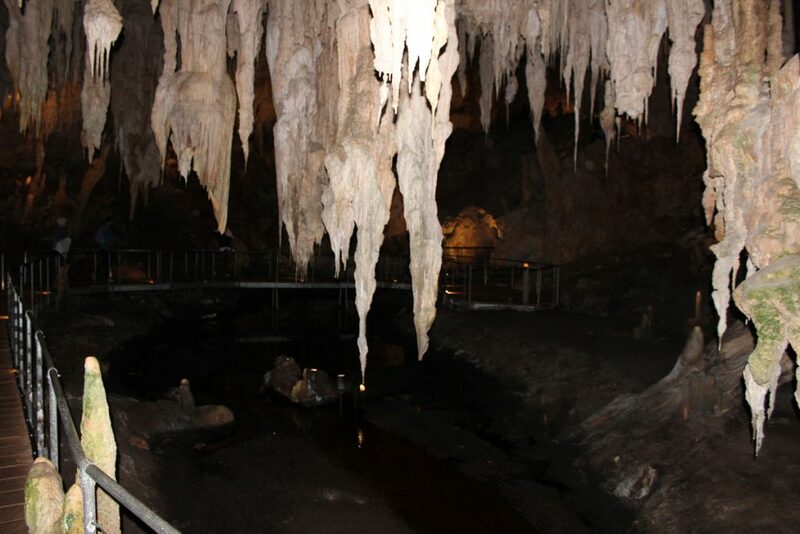 The Mammoth Cave is one of the few in the region to have fossils and was an active paleontological dig in the early 1900s for its record of the Pleistocene era. This includes the Zygomaturus, a pre-historic marsupial that looked like a pygmy hippopotamus. There is a fossil of a jawbone of the creature in the cave but I had a hard time distinguishing it from the surrounding rock. 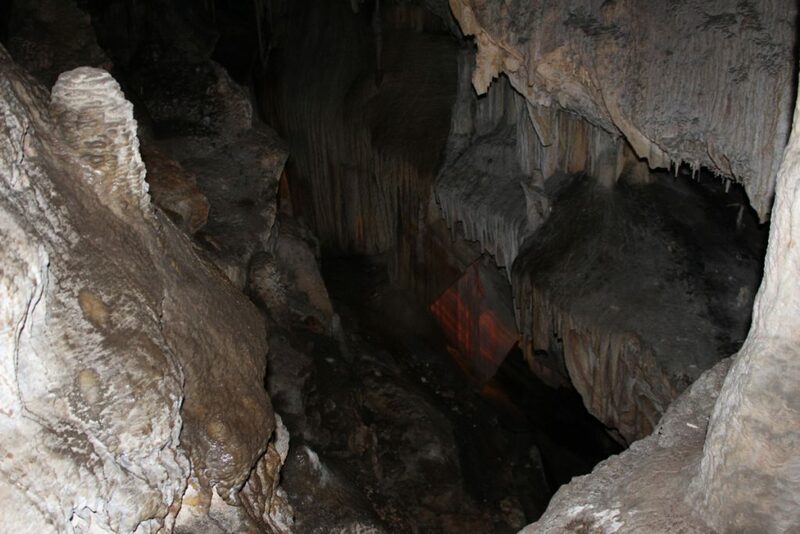 Inside the cave, on the other side of the first chamber, you’ll find a set of stairs leading to an upper chamber. A set of stairs take you to the top of the chamber to see the area beyond. 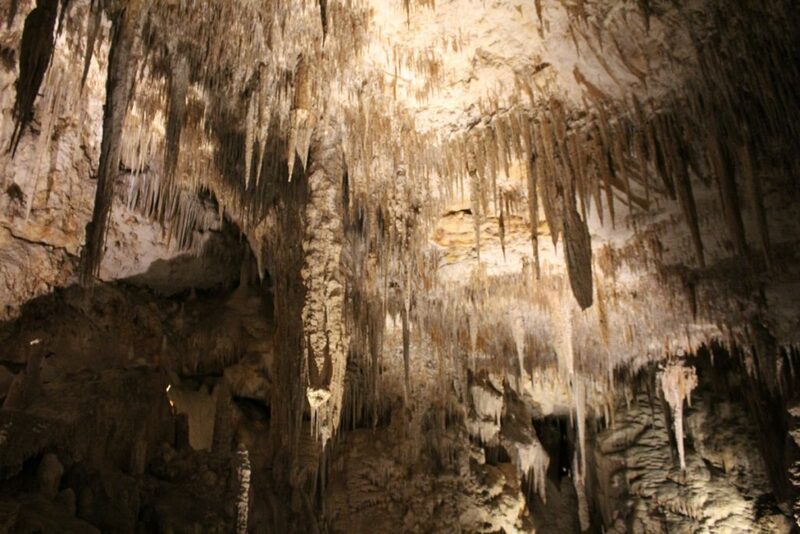 All along the cave walls beautiful stalactites hang down like icicles. 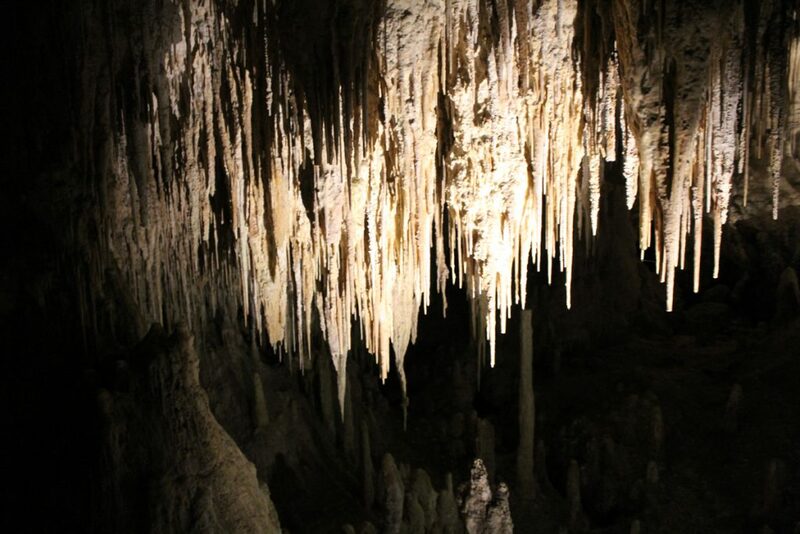 Beautiful stalactites are everywhere in the cave. 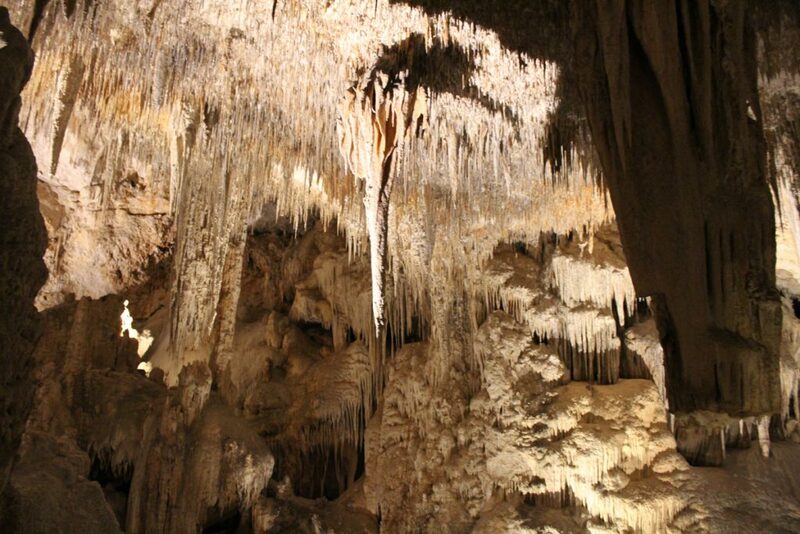 The cave is interesting in that its stalactites and stalagmites do not all point straight up and down. This is because parts of the cave ceiling have broken off and fallen to the floor below over the years and, of course, they didn’t land straight. 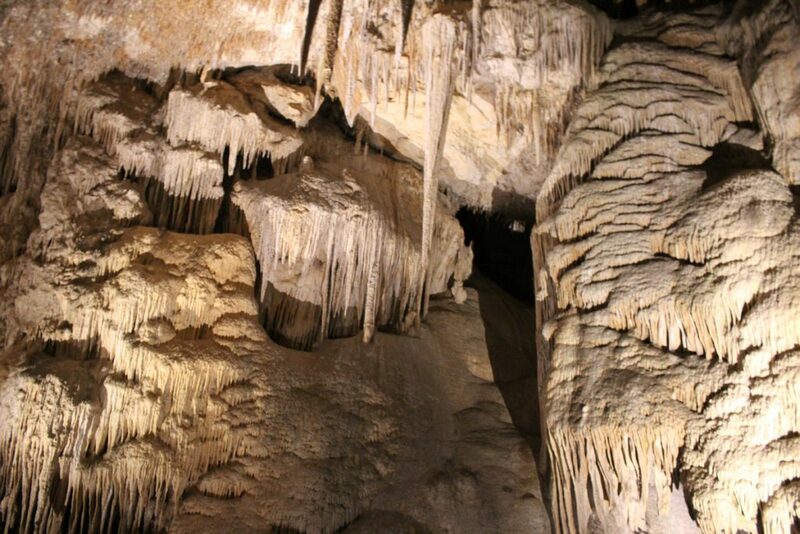 Note the stalactites on the left and the ones on the right point in different directions. Two giant rock masses collapsed off the ceiling here resulting in this odd formation. 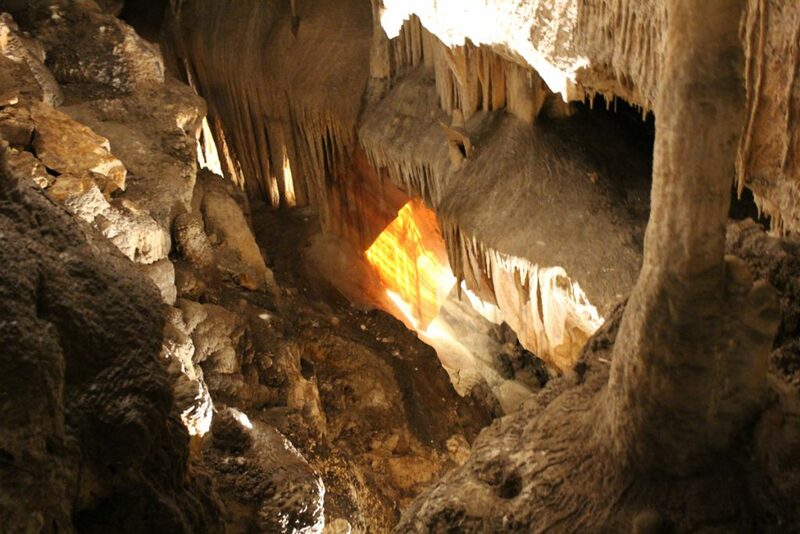 One interesting formation in the cave is a yellow-orange flowstone. You can only see it from a distance but such sheet formations are not uncommon. The colours derive from tannins in the water flowing over the rock. A colourful flowstone in the Mammoth Cave. I was at a bit of a quandary taking pictures in the cave as the cave is fairly well lit and you can take pictures with flash off. But pictures using flash show up quite differently. Most of the pictures I took with flash off. This is what you actually see when visiting. But using a flash removes the effects of the artificial lighting and shows the rock formations in their actual colour – a whitish-grey. Note the difference between the picture above, taken without flash, and the one below of the same flowstone with flash. Same photo of the flowstone taken with flash. 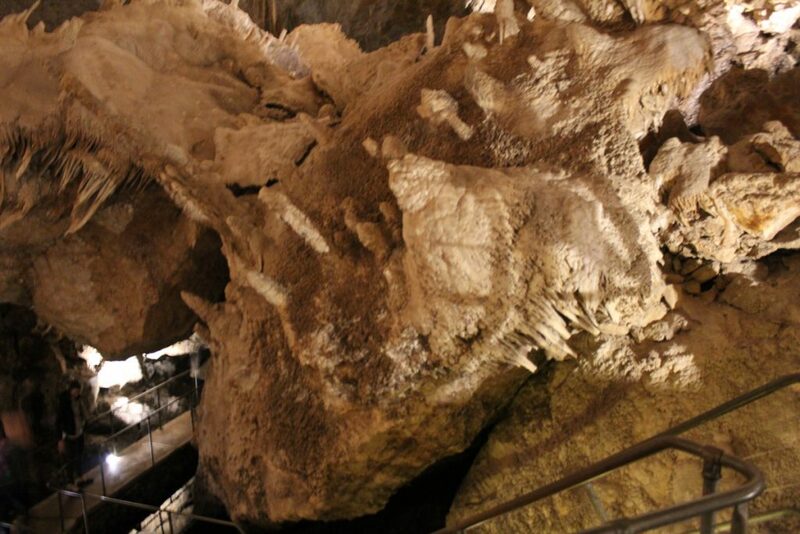 The Mammoth Cave is a bit different from the other three publicly accessible caves in that the others are all single access – you go into the cave, explore it, and come back out. The Mammoth Cave is a through cave. You go in one end and come out at a different location. It used to be a single access cave but a collapsing sinkhole created an egress about a half a kilometer from the entrance. Towards the sinkhole egress, natural light allowed moss and lichens to cover the rocks along the stream that runs into the cave. 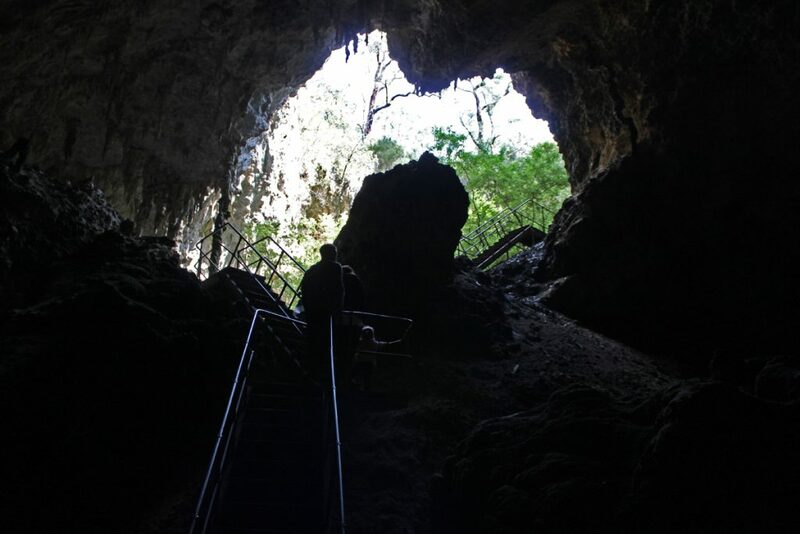 The sinkhole is a deep one and a series of stairs go up 160 steps to the top. The top of the sinkhole from down below. Looking into the sinkhole from the top of the stairs. 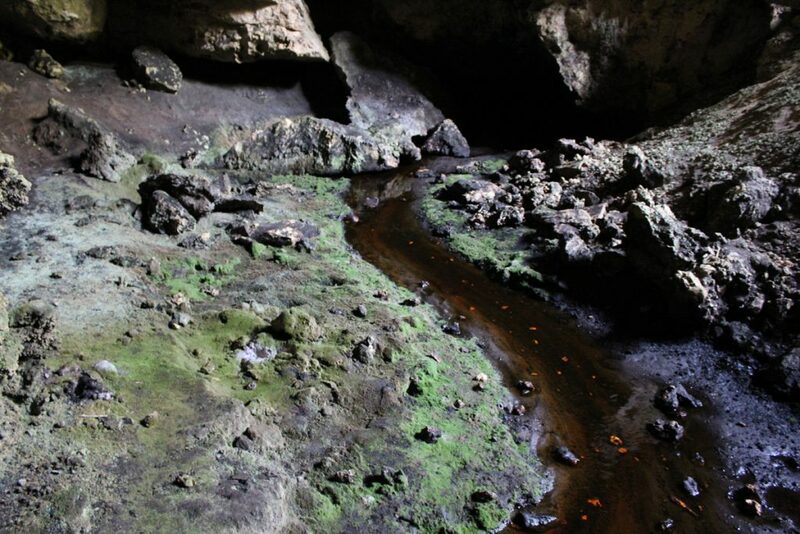 The sinkhole covers a large area and you can see the limestone formations surrounding the hole. 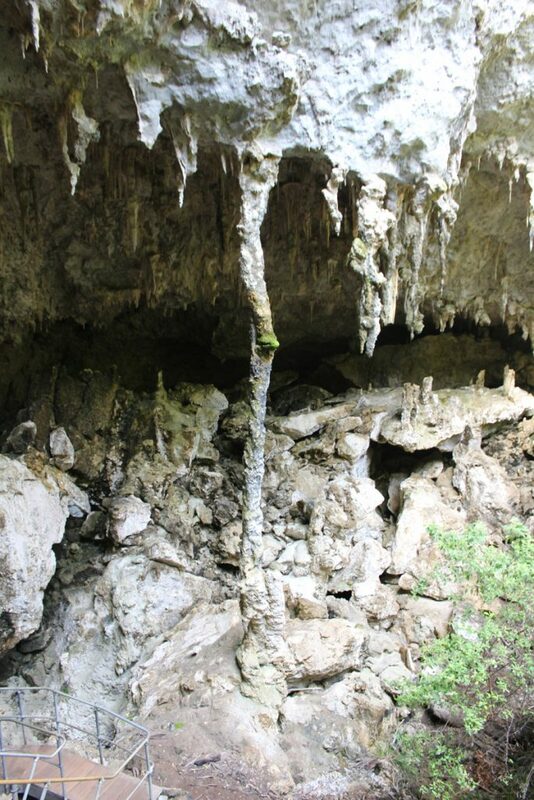 Limestone formations surround the sinkhole. This is a composite of three photos. Emerging from the cave we arrived at an exit gate and found out we had come out on the other side of Caves Road. We crossed and had a choice of two walks back to the visitor center, a long one – 600 meters, and a short one – 200 meters. With a toddler in tow we opted for the shorter one. Both take you through a beautiful expanse of marri forest, a lovely walk to end an interesting visit. 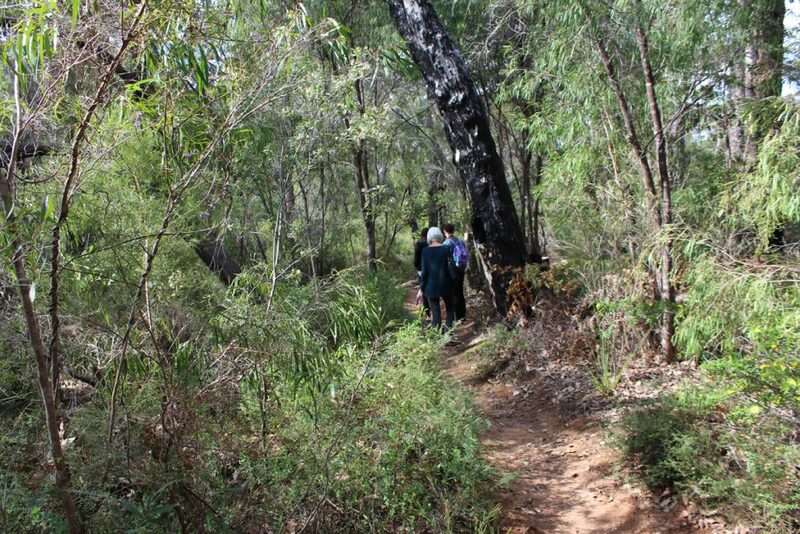 Along the walk through the marri forest. We enjoyed our tour and on a return visit, I’d like to explore the other caves as well. 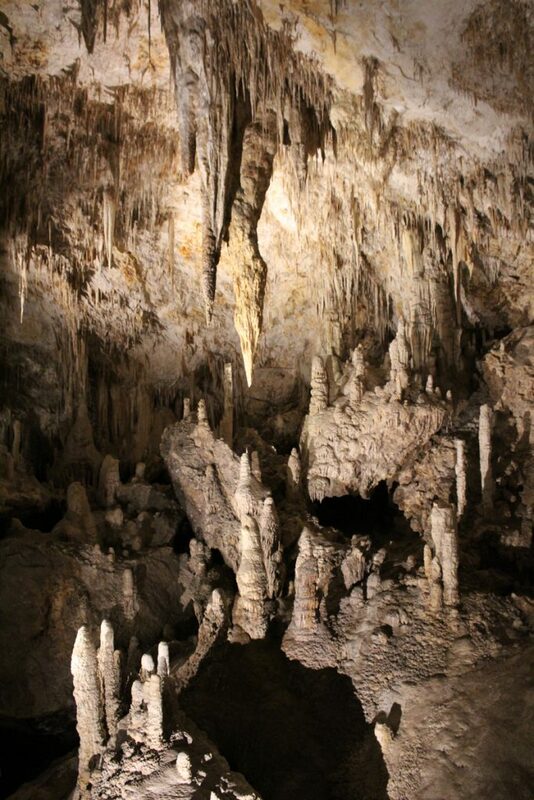 This was the first cave I had seen since 1980 when my wife and I visited the Oregon Caves. Some day I’d like to see some of the really big ones, like the Carlsbad Caverns or Kentucky’s Mammoth Cave. Be sure to check out the Photo Gallery for more pics. 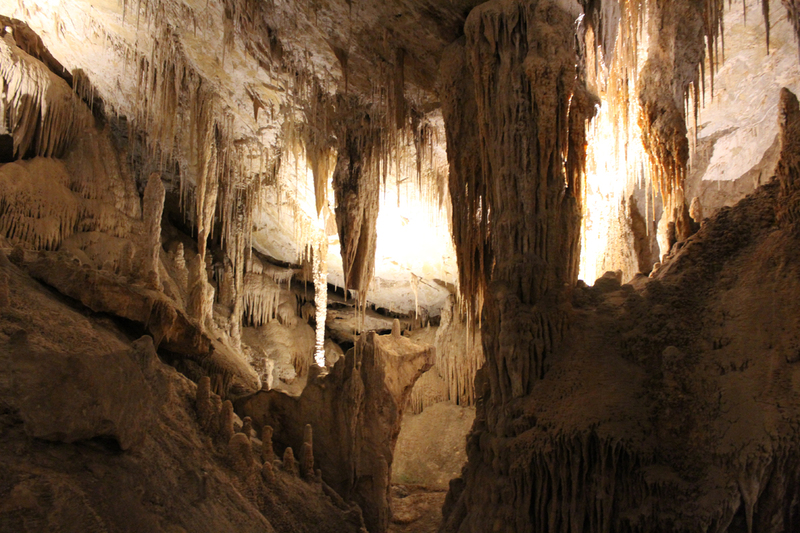 Here are some additional photos from our visit to the Mammoth Cave in Western Australia. The one above is looking at the sinkhole from near the exit. The first chamber we entered. This photo was taken with a flash. Compare it to the one without flash in the original blog post. 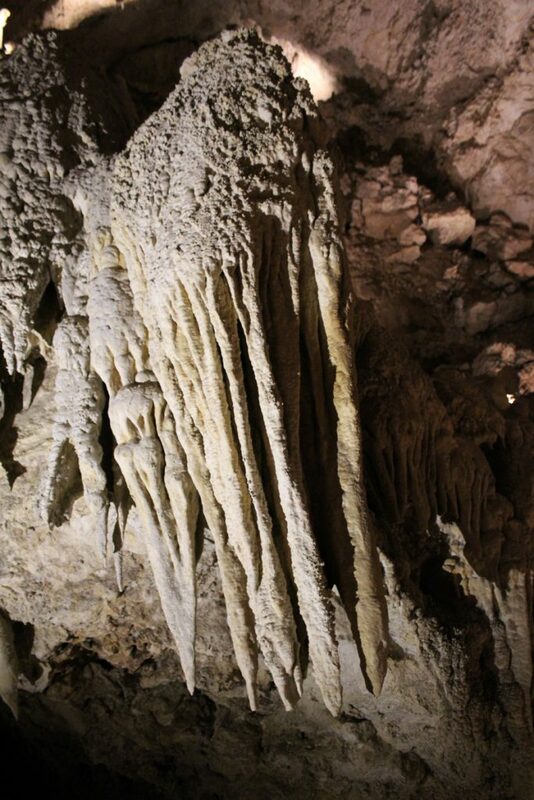 Some of the limestone formations in the cave. Stalactites and stalagmites reaching towards each other. The ceiling of one of the chambers. With flash, the rock formations show their true whitish grey colour. There is something surreal and beautiful about caves. The exit from the cave. Looking down into the sinkhole. 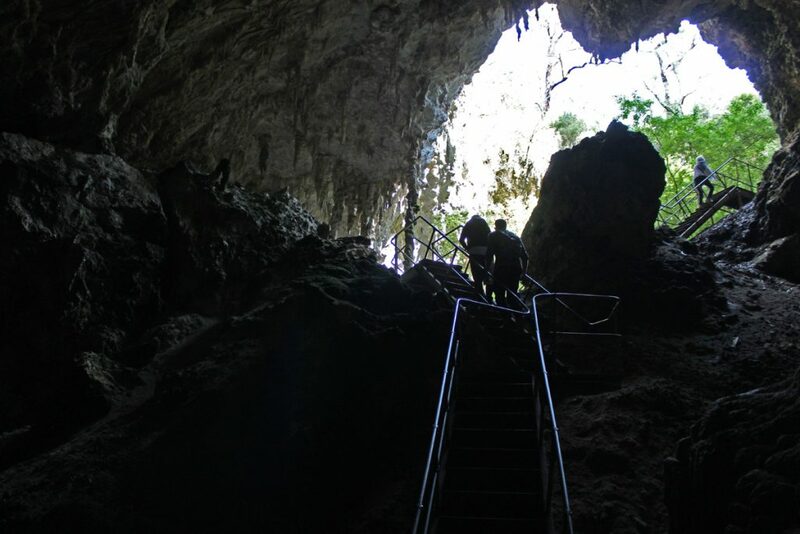 The staircase into the sinkhole. This is a composite picture. That concludes our look at Mammoth Cave.